What to watch:While some might wonder ifPete Alonsocan keep up his early-season hitting exploits, fantasy fans already know this should be a two-start week for Noah Syndergaard, with turns on Monday night and next weekend. So far, Thor is throwing his fastball more often than he has since 2015, with velocity sitting at about 98 mph, while generating an eye-popping 20-2 ratio of strikeouts to walks in his first three starts. Hitters are managing an exit velocity of just 83.9 mph against him, tied for second lowest in baseball. What to watch:Suffering a sweep at the hands of the Astros may have reminded Seattle who the big dogs of the AL West are, but the Mariners' surprising hot start is creating new heroes on the national stage. Start with Marco Gonzales, still 4-0 despite Seattle's loss in his last start. Also, what has gotten into Daniel Vogelbach? The beefy backup 1B/DH has ripped 10 extra-base hits, six of them home runs in just 12 games, slugging .973. What to watch: Welcome back the Dodgers' inconsistency that bedeviled them in years past. Their six-game losing streak they finally snapped Sunday was their longest since they tumbled 11 straight times in 2017. But now thatClayton Kershawis due back from the IL to pitch Monday night, L.A. might be able to flip the script and reel off a winning streak. What to watch:It's early, but the slight improvement Marcell Ozuna is showing in his average launch angle (up three points) is showing bigger dividends in his power, as he's slugging almost 200 points higher. A trip to Miller Park should give him a good venue to see how well those improvements will pay off against the Brewers in an already important NL Central showdown. What to watch:A little later than teammates Ronald Acuna Jr. and Ozzie Albies, shortstop Dansby Swanson might be having his own breakout season at the plate in his age-25 season; his .995 OPS is best among NL shortstops. And with three games against the team that traded him to lead off the week, he might be able to show off what Arizona missed out on after sending Swanson to Atlanta in the now-infamous Shelby Miller trade. What to watch:Everybody knew when the Phillies signed Bryce Harper that they were getting an OBP machine. What was less expected was that Andrew McCutchen would slide into the leadoff role and be just as potent at getting aboard -- the duo of free-agent additions are tied for the MLB lead with 14 walks apiece. How that grinding approach works out against the Mets should bear watching in the first series between the teams this season. What to watch: The Padres head home in first place after a 7-3 road trip despite having a minus-3 run differential on the season. Part of the reason is their pitchers have been great at stranding runners (NL-high 108), but of course that also means they're letting a lot of guys on in the first place.Fernando Tatis Jr. came alive on the trip, posting a 1.180 OPS. Now he'll try to impress the home fans, in front of whom his OPS is just .619. What to watch:As if getting swept by the Royals over the weekend wasn't bad enough, seeing Corey Kluber get crushed Sunday while walking five batters in a turn for the first time in his career doesn't bode well. And when will Jose Ramirez's bat come to life? Between a .373 OPS and no homers so far, last year's MVP-worthy breakout seems like a distant memory. What to watch:Fueled in part by Khris Davis' MLB-leading 10 home runs, the A's will have to run their streak of seven straight games with multiple home runs up against the Astros, but will at least miss both Justin Verlander and Gerrit Cole in their abbreviated series. What to watch:Following a snow postponement Sunday in Chicago, the Cubs head to warmer climates having somewhat righted their ship following a 1-6 start. Offense hasn't been an issue, especially if Jason Heyward can continue his resurgence. Heyward has a .375/.460/.700 slash line with four homers and 10 RBIs. Two big changes from his recent struggles: an improved launch angle (19 degrees this year after being at 9.0 from 2015-18) and a K rate of just 8.0 percent (second best in baseball). What to watch:The surprising first-place Twins have a chance to pad their AL Central lead against the AL East's bottom-feeders. Eddie Rosario has helped fuel Minnesota with an 1.187 OPS over the past nine games, but his combined career OPS against Toronto and Baltimore is just .647. What to watch:The Pirates, who were 15-5 in interleague play last season, dive in against the AL for the first time this season Tuesday and Wednesday at Detroit. Pittsburgh's surprising pitching staff (2.69 ERA) faces a pair of teams hitting below .210 for the season. What to watch:Yasiel Puig hit his first home run as a Red on Sunday, just in time to get off the schneid as he faces his former teammates in his former home ballpark. Will a return to Dodger Stadium cure what has been ailing Puig's bat? As bad as Puig's season has been (.502 OPS), it's almost 100 points better than fellow former Dodger Matt Kemp (.405). What to watch:Tune in Tuesday to see how Matthew Boyd -- whiffing batters at an MLB-best 15.1 K/9 clip -- fares against the Pirates, who beat him badly in both of his previous starts against them. And then stay tuned to see if he draws the assignment against the White Sox on Sunday -- Boyd has an 18-inning scoreless streak against them ever since Chicago inflicted a five-run inning on him on Aug. 27, 2017. What to watch:After suffering their third shutout loss of the season Sunday, the Giants have been held to one run or none in seven of their first 17 games, they're below the Mendoza line at the plate, last in the league in OPS (.572) and OBP (.259), and next-to-last in runs (averaging just 2.76 per game). All of that has combined to mute the excellent start from the pitching staff, whose 2.75 ERA ranks third in the majors. What to watch:Coming off a 4-5 homestand, the D-backs open a 10-game trip looking to build some positive momentum.Robbie Rayis scheduled to start Tuesday's opener at Atlanta, and though he has allowed three or fewer hits in three straight starts to begin the season, he also has 11 walks. Pitch count issues have prevented him from going deeper than 5 innings. 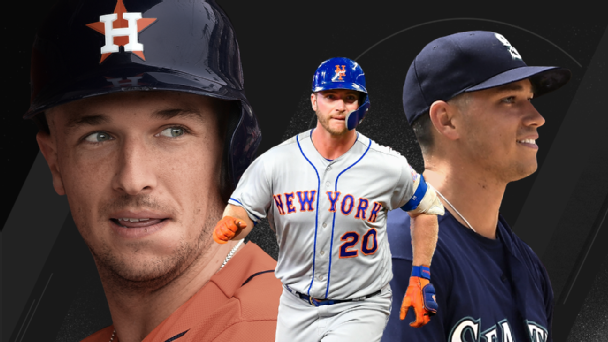 What to watch:This figures to be a challenging week for the Rangers, who scored just four runs in suffering a three-game sweep at the Angels earlier this month, then tangle with the red-hot Astros. Texas' rotation, which was held together with bubble gum and shoestrings to begin with, could use some good signs from Shelby Miller, who is scheduled to make two starts, including Monday. His first two starts haven't gone well (5 IP, 8 walks, 3.18 WHIP, 9.53 ERA). What to watch:The combination of a slow start, an injury-wracked pitching staff and a long road trip may not sound like a great week to watch them, but the window for Vladimir Guerrero Jr. to get called up without being credited with a full season of service time should soon open. He already has hit his first home run at Triple-A Buffalo, so it's only a matter of time. What to watch:Needless to say, the Rockies are in scramble mode, having lost 12 of 13 before German Marquez one-hit the Giants on Sunday. They're tied with the Marlins for last in the NL with 46 runs (which can't last, right? ), and start the week with two games at the first-place Padres. Then they host the Phillies at Coors Field, where they still haven't won a game this season (0-5). What to watch: Check out Tim Anderson 's see-ball, hit-ball approach while he's still hot: his MLB-high .500 BABIP while seeing just 3.27 pitches per plate appearance (185th out of 188 players). What the White Sox need to see is their rotation get turned around; their 6.78 ERA is second-worst in the majors, with both Lucas Giolito and Reynaldo Lopez combining to allow 31 runs in 29 IP. What to watch:Brad Keller is showing that his strong rookie season was no fluke, opening the season with four straight quality starts, five if you count back to last season. With a 1.8 ground ball/fly ball ratio that rates in the top five and a strikeout rate that's going up, he might take the injured Salvador Perez's place as a legit Royals All-Star. What to watch:The lineup may be struggling to score, averaging just 2.9 runs per game, and they may not have won a series yet this season, but they finally reached five figures in attendance for a home game in both of their weekend games. Will the marquee power of the Cubs and Nationals keep that streak going? Having Trevor Richards and Caleb Smith going strong in the rotation might also help. 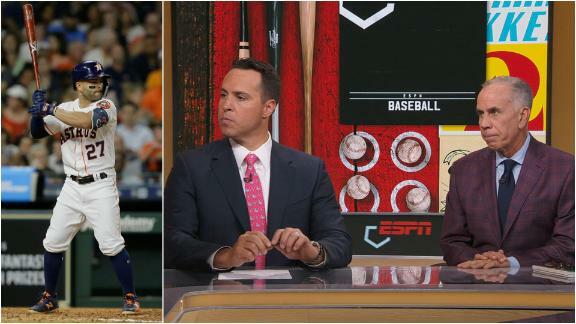 Tim Kurkjian and Mark Teixeira rank the five best teams in baseball and which teams have surprised doubters this season.